We completely dried the structure and removed damaged material after this house had a leak. We also applied an antimicrobial to prevent mold growth. Flooding causes various kinds of damage to buildings and needs to be dealt with promptly. It promotes the growth of fungi like Aspergillus and Penicillium. These fungi can lurk in wallboards and other hard to access areas, contaminating the air in your home. Water in your home can also cause mildew and mold to grow on clothing closets, drapes, inside the walls and attics among other places. Mold and mildew can cause upper respiratory health problems, musty odors, and financial devastation as you work to fix the damage caused to the structure of your residence. To prevent the dangers associated with flood damage in your San Jose residence, you need to hire professionals who can remove the water, toxins, and odors left behind. The remediation service technicians at SERVPRO are qualified to handle biohazards. We can remove toxins and pathogens from the affected areas. Our technicians have the training, specialized equipment, and protective gear to clean this kind of contamination. Our technicians wear personal protective equipment like chemical resistant gloves, heavy duty gloves, rubber boots, and full body suits to stay safe. The biohazard contamination of your home can increase your stress levels. Our technicians treat every customer with compassion and sensitivity. We seek to exceed the expectations of our customers when it comes to restoring their flood-damaged homes. We have extraction, air moving, dehumidification, and deodorization equipment that makes our job easier and enables us to provide a higher level of service. Flood damage may also leave bad odors in your home. Eliminating these odors without having to rip up the flooring and replace everything is daunting. When black water damages some kinds of flooring, such as carpets, we recommend replacing them. After replacing the flooring, using an ozone generator is the most appropriate way to deal with the awful orders. SERVPRO technicians can set up the ozone generators in your home to get rid of bad odors. These machines are useful in cleaning, sanitizing and removing all types of foul odors. 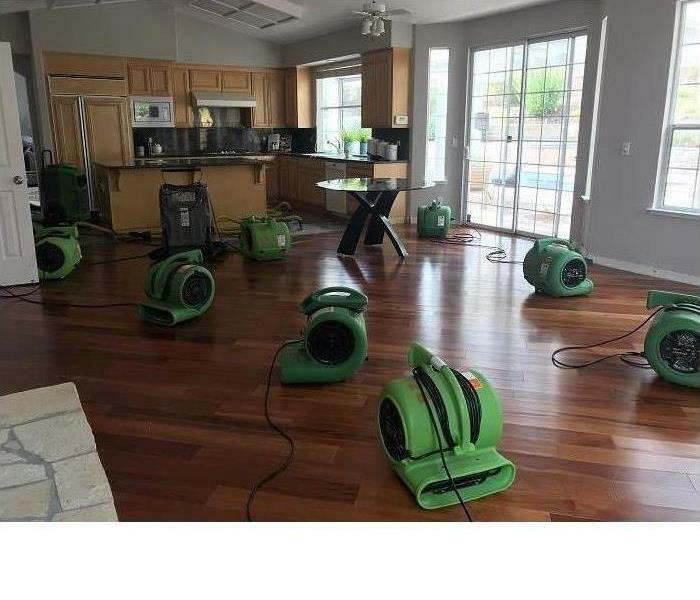 When there is flood damage in your home, our technicians have the expertise to make it appear “Like it never even happened.” Contact SERVPRO of Campbell at (408) 371-4001 for cleanup, drying and deodorization services. We serve the residents of San Jose, Fremont, and Campbell among other neighboring communities. Click here for a list of attractions and amusement in San Jose. 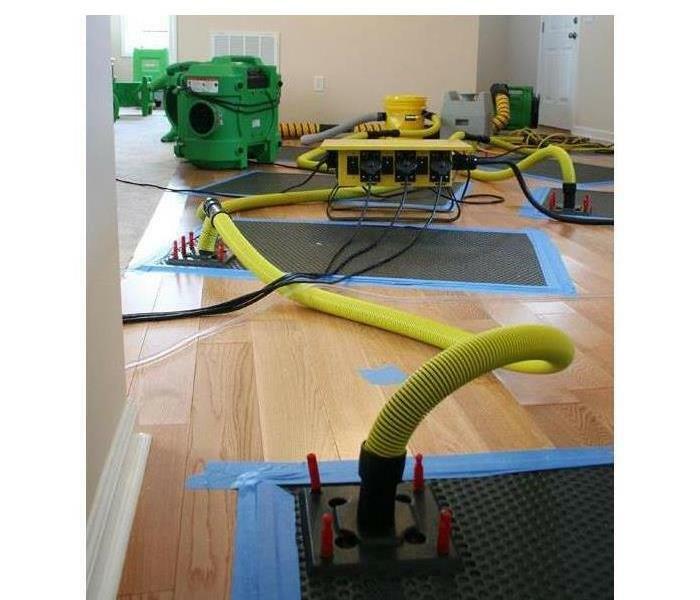 We have the equipment and experience to handle any water damage in your home. Call us right away we are available 24/7. Preventing water damage in your Monte Sereno home is critical to preserving the strength and integrity of your structure. Usually, some simple checks and steps plus some preventative measure can avoid any water catastrophes. The bathroom is likely the area which is most prone to damage from water. Each time you use the bathtub for a shower or a soak, you use several gallons of water. If you regularly check around the area to rule out any moisture accumulation, you can stop disasters before they happen. When you do find water damage in your Monte Sereno bathroom, you need to act fast to correct the issue before additional damage is done. That is why SERVPRO is the right choice to turn to for help. Our staff understands the need for speed but are also trained to handle the job thoroughly and efficiently. With the tools and experience you would expect from professionals, we can restore your home, so it is like nothing ever happened. Your first precaution should be to make sure that you and the rest of your family are not overfilling the tub during a bath, and not splashing water outside of the tub. That is why children should be supervised, besides ensuring their safety. When showering, make sure that the door or shower curtain is securely closed so that all the water remains inside the tub. SERVPRO techs use various tools to help us find the moisture problem and to dry everything back out. In a bathroom situation where the tub has leaked, we can use thermal imaging cameras and moisture meters to detect how much moisture is in building materials and to monitor them as we are drying everything out. Air movers and dehumidifiers help us to dry the affected materials out and get the moisture content in the air in your bathroom back to a safe amount. Other things to look out for include any staining on the walls around your shower or tub or any mold growth. These are both sure signs you could have an issue that is out of sight. Also, make sure to replace any loose or missing tiles in your shower or bathtub wall right away. Ensure there is no missing grout between the tiles as well and reapply grout as you need. Check the caulking between tiles as well and repair as needed. SERVPRO of Campbell is always standing by to help you with any water damage emergency in your home in Los Gatos, Fremont, or Newark. You can call us at (408) 371-4001 anytime you need, so please do not hesitate to reach out as soon as you see an issue. Learn more about a city that has beauty, a great location and superior schools, click here for more information. Fire damage is not a one-size-fits-all category when it comes to clean up. Depending on the type of fire, whether it was high heat or slow moving and materials that burned, all of them leave different types of residues and odors that need to be handled in various ways. Among the kinds of damage from fires we remediate most often, protein residue is one of the most pungent we encounter. No one wants to be reminded of the time dinner caught on fire from the odor that remains. When SERVPRO was called to remediate fire damage in a San Jose kitchen, the culprit was immediately apparent; it was from a chicken that was forgotten in an oven and was too close to a heating element. Protein fires are caused when food items burn. They generally have minor amounts of residue but leave a significant amount of foul odor. At the initial phone call, we instructed the homeowner to turn off their HVAC to avoid spreading any particles and odors to currently unaffected areas of the home. Once on site, SERVPRO technicians wiped down all the kitchen surfaces with our professional-grade cleaners to remove the greasy protein residue, and this action helps lessen the odor. Then our certified Odor Control Technicians inspected the area and determined the best course of action would be to contain the kitchen area and use an activated oxygen unit overnight and follow up with a thermal fogger both inside and outside the contained area to neutralize the odor. Thermal fogging is very useful as it binds with odor-causing particles and eliminates them. This method is not just covering up one odor with another. Sometimes fire damage is not from the flames, but the odor left behind. This is not a situation you have to handle on your own. 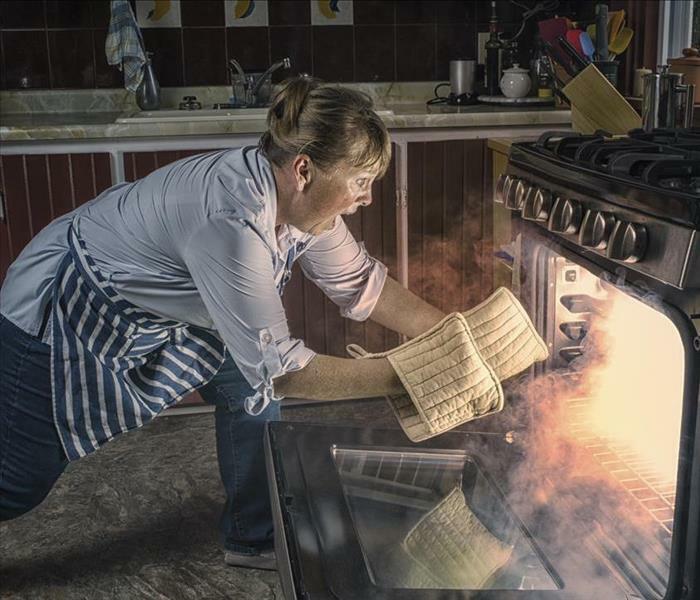 Call SERVPRO of Campbell at (408) 371-4001, and one of our certified technicians can help you get rid of unpleasant odors from a cooking mishap. Welcome to the SJFD, just click here. We will handle the water damage restoration in your home 24/7. We begin quickly extracting the water to save further damage so call us right away. Appliances have become instrumental in convenient living for San Jose homeowners, but these machines are not impervious to failures or malfunctions. A common concern with water-fed appliances like your washing machine, dishwasher, and other similar units are the gaskets and seals that hold water in or prevent leaks at the connections with the water supply. While often this is little more than a single piece of rubber, the erosion of this component could very quickly flood the immediate area around the appliance should it cause a disconnection or substantial leak. 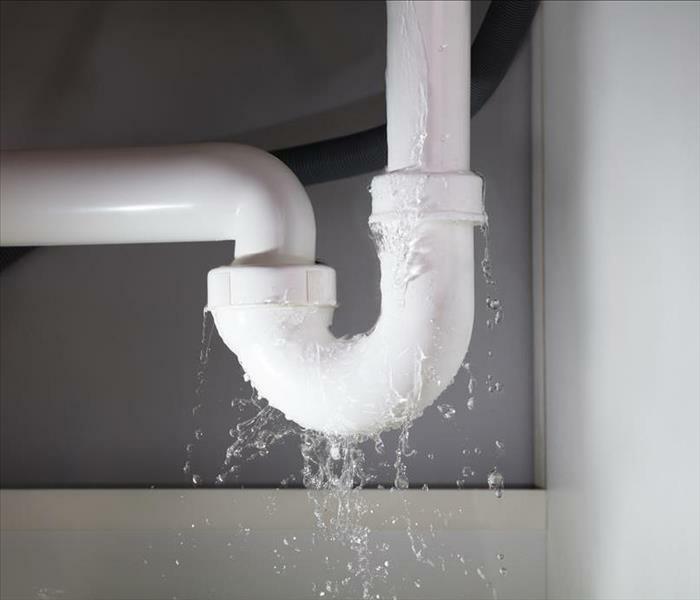 While most appliances have an independent shutoff valve to prevent further flow onto the floor of your San Jose home preventing significant water damage, that is rarely before the incident has spread enough to require immediate water removal services. From the time that this disaster strikes, you should reach out to our SERVPRO professionals immediately. Our highly-trained technicians have fast extraction equipment that can work to protect flooring materials and other structural elements exposed to the pooling water. The first step once our technicians arrive at your home is to get our team working right away on removing the excess water throughout the damaged areas of your property. 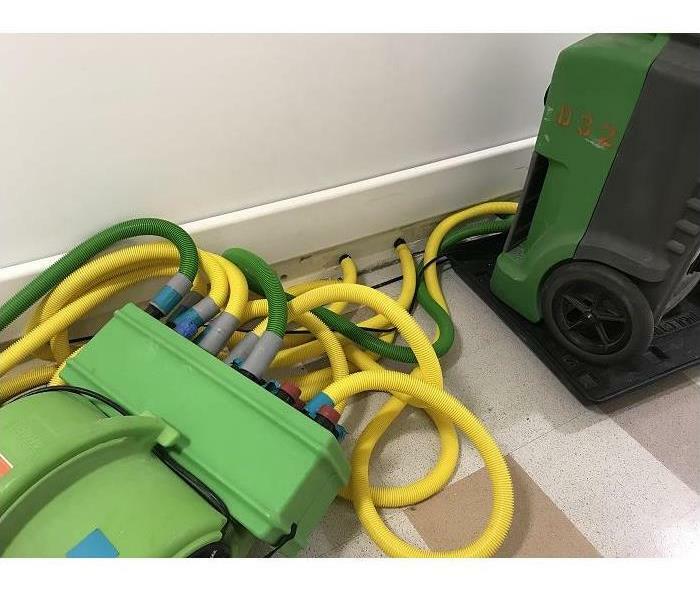 While we have extractor trucks and gas-powered pumps for substantial water loss incidents that could occur, often our portable sump pumps and other specialized equipment can prove sufficient for removing both pools of water and the absorbed water in saturated materials like your carpeting. Restoring your hardwood flooring in the kitchen or laundry area of your home is an intricate task for our SERVPRO team. We have tools like our air movers and injecti-dry system to begin pulling moisture from the exposed flooring, but this work needs to get regularly monitored to manage the moisture content in the wood. This type of flooring can become overly dry, causing as much water damage as over saturation would. While there are many steps to restoring your home after a water loss incident from one of the appliances, water removal and the appropriate mitigation work must come first. Our SERVPRO of Campbell rapid response team is available to help 24/7 by calling (408) 371-4001. Check out the Children's Museum, click here for more details. SERVPRO of Cambell has the equipment to quickly dry your home. Whenever disaster strikes your San Jose home in the form of a water loss incident, you need assurances that the right professionals can arrive promptly to begin drying up the damage before it gets out of control. Whether you have required the services of professionals like ours in the past before or not, it is no secret that we work to have the industry-leading equipment to get the job done quickly and correctly. It is our priority to offer fast and effective service to our customers, regardless of the time that they need it. Much of the success that our team has had with recovering water damage to San Jose homes can get accredited to the focus that we have on accruing the best available equipment for the jobs that we do. Our SERVPRO team has many tools and machines ideal for extraction, drying, and cleanup. When we become aware of an emergency affecting your property, we can respond fast to ensure that these tools stocked on our production truck rolling out to the scene is all that we would need. When our team arrives at your home, we begin with a thorough assessment of the damage and determine what actions must get taken to restore the water damage completely. This process also includes determining the source of the damage and ensuring that this area gets repaired to prevent further exposure and damage in the immediate future. Leak detection equipment, moisture detection equipment, and thermal imagery all play a vital role in this initial phase. To dry out the damage to your property, we have many tools that can do this effectively. 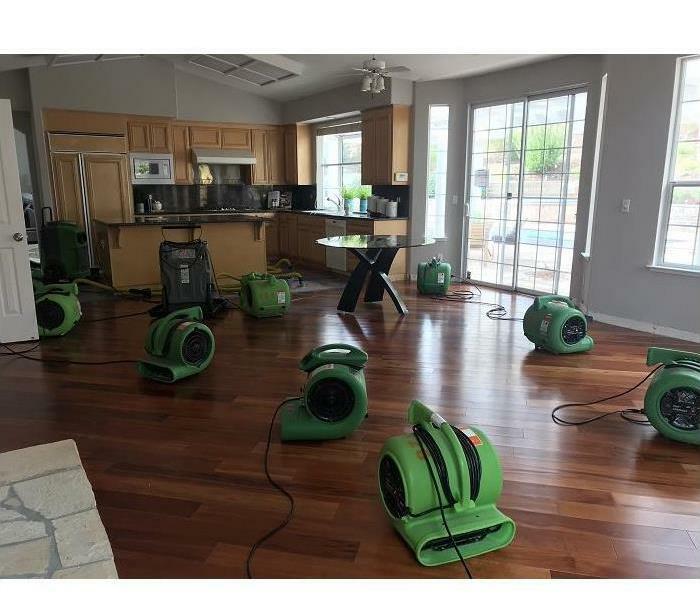 Often our SERVPRO professionals rely on high-velocity air movers and LGR dehumidifiers for residential water damage recoveries. We can also use tools like our injecti-dry system to help impact inaccessible areas like wall cavities, ceiling cavities, and beneath flooring material. While many steps make up water restoration for your home, our SERVPRO of Campbell response team arrives with the tools to get the job done fast. You can reach our experienced professionals 24/7 by calling (408) 371-4001. Read about San Jose’s professional sports teams here. 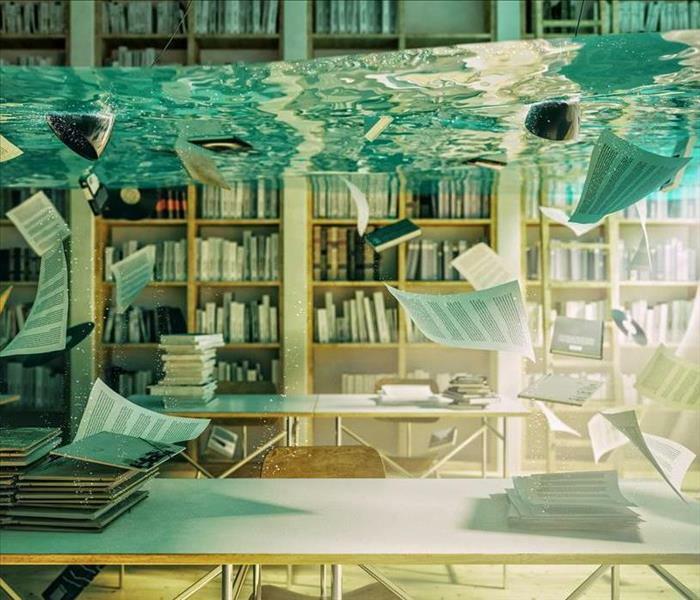 Our technicians have the proper technology to restore business documents from water damage. When there is a water leak or spill in a commercial establishment, most of the focus is on removing standing water to restore normal operations. However, apart from what pools on the floors, the water might affect other areas too causing unforeseen challenges especially if a professional does not do the restoration. We have extensive experience handling such special situations in San Jose. Documents and electronics are likely to be involved in the case of commercial water damage in San Jose emanating from a problem in the fire suppression sprinkler system. The issue with such loss is not the replacement cost of the items, but the loss of data, which can cripple day-to-day operations at the business. Our SERVPRO technicians take steps to safeguard your documents. This mostly involves freezing them to prevent further deterioration, then drying them through sublimation, which changes a solid directly to vapor, without passing through a liquid state. Through such processes, we help safeguard ownership documents and business records. Cabinets and other holding spaces in commercial establishments can present challenges when restoring water damage especially if you do not have the right equipment. Many cabinets have laminated surfaces that act as a vapor barrier. Such a barrier can interfere with detection thus leaving excess moisture in the material that can cause problems in the future. Cabinet backs also add an extra layer of materials over drywall, which can prolong the drying process. Our SERVPRO technicians use moisture sensors with probes to check the actual level of saturation in affected materials. We also use hole-saws to cut holes at the back of the cabinet allowing a venting system to circulate air in the wall cavity expediting drying. Checking HVAC ducts is also essential if there is a chance, the water affected them, to eliminate the possibility of mold development and air quality issues. Our SERVPRO technicians check the material lining the ducts before determining the best course of action. Cleaning sheet metal duct is simple. However, other materials like flex duct and fiberboard may require additional steps. Call SERVPRO of Campbell to help you deal with special situations after water loss in your business. You can reach us at (408) 371-4001 any time. We're Faster To Any Size Disaster. For more on San Jose, click here. SERVPRO Franchise professionals have the training to locate hidden mold in your home. Homeowners hear about mold infestation often, but rarely do you think it could happen to you. Even those living in San Jose, which is not as humid as other parts of the country, are susceptible to having their home threatened by mold. The question is whether to call a professional team to help or if you want to tackle the issue yourself. As tempting as it may be, it is best to rely on experts when dealing with mold remediation. When you encounter mold damage in your home in San Jose, your initial call should be to your local SERVPRO Franchise System. Our crew not only has the years of experience but is also specially trained to eliminate your mold infestation. Mold spreads throughout our environment very quickly, and it requires very little to reproduce. Even when you utilize readily available mold killing solutions, you may be missing on an entire area of growth in places like behind your walls, attic or basement. When our team of experts reviews your home, we recognize the extent to which mold has invaded your structure. It is during this assessment that our SERVPRO Franchise professionals utilize plastic sheeting and other methods to stop any further spread of mold in your home. We use personal protective equipment to make sure we are not affected as we act swiftly to remove and prevent the spread bacteria. In more extreme cases we may even use negative air pressure to avoid the spread of mold spores. In the removal process, we scrape and wipe each surface, as well as implement other advanced techniques. Soda blasting and disinfecting solutions are also part of a complete remediation process. Our industry experience allows us to achieve a swift and thorough success. This success is only possible because we train on the latest techniques and utilize equipment well beyond what the average homeowner would use. 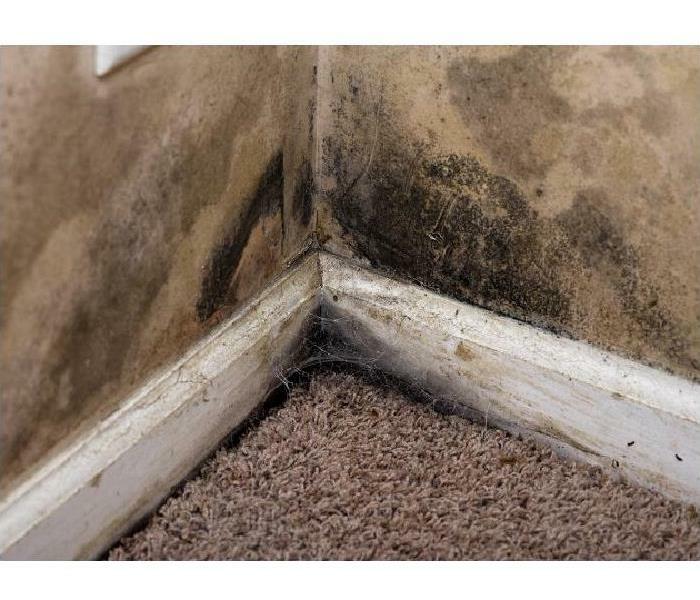 You can capitalize on our experience as well by calling us whenever you first detect the presence of mold in your home. At SERVPRO of Campbell, we are one phone call away. Call us at (408) 371-4001 so we can visit your home and inspect the damage. Together we can develop a plan to make sure your home is mold-free and safe for you and your family. Read about San Jose here. Mold is common in San Jose. Call SERVPRO at the first sign of mold. When you encounter mold damage to your home in San Jose, call SERVPRO and enlist our team’s expertise towards managing and eradicating the presence of mold on your belongings. 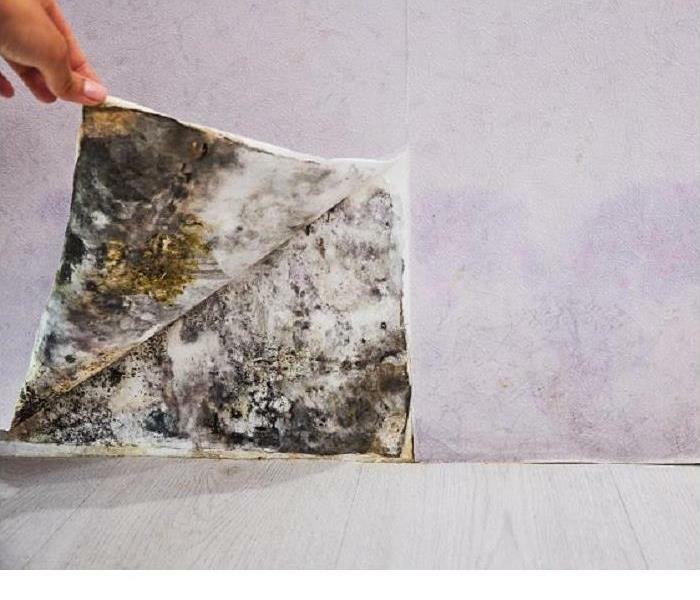 Moisture is the breeding ground for mold, and the Environmental Protection Agency (EPA) offers guidelines focused on cleaning, discarding and drying moldy items per relevant recommendations. Our team is well-versed on these action steps and is trained to act accordingly. Our professional approach and extensive training are what sets us apart from others. Above anything else when you face with mold damage, please call SERVPRO of Campbell at (408) 371-4001 so you may have an experienced and reputable team at your side. We work very hard to make your home "Like it never ever happened." Click here for information about the Joseph D. Grant County Park. Call SERVPRO to save your belongings after fire and smoke damage have struck your home. If something ever burns inside your San Jose home, it is possible that the blaze torches things fast and engulfs a good portion of your contents and building materials. 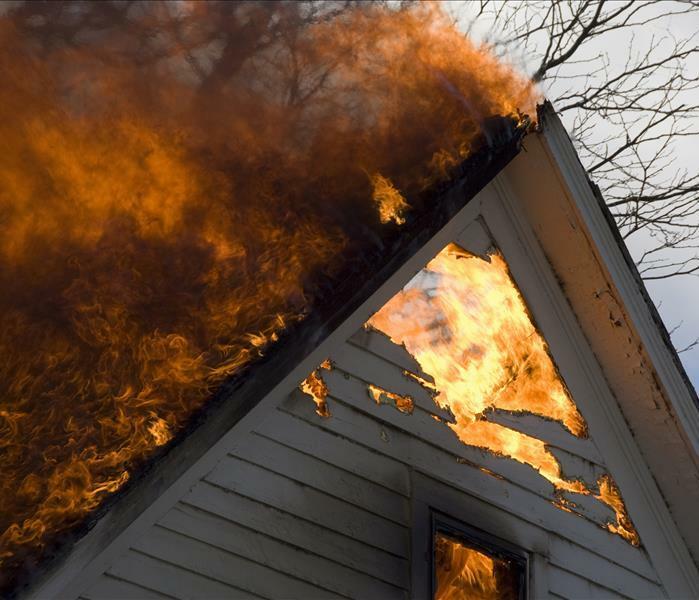 Once flames ignite, they can quickly spread throughout your home and use just about any substance as fuel causing you a significant amount of fire damage. In most cases, if the fire gets extinguished quickly, the loss will be less than if it has time to burn. The more oxygen the blaze receives, the hotter and faster it will burn. When several items inside your home get heated, it can become necessary to call in a professional fire damage restoration company such as SERVPRO. Whenever things burn inside a building, items can get fully combusted and just partially charred. Any time our SERVPRO technicians work on a fire damage project in San Jose, we first figure out what we think we can save with cleaning and refinishing and what we know will have to be removed and replaced. To figure this out, our estimators arrive at your residence with a testing kit. The kit comes with all of the proper tools to test objects and their surfaces to see what work will need to be done to bring your house back to its original, preloss condition. Once we determine the overall scope of the job, we calculate an initial estimate detailing what we think needs to be done during restoration and give it to you and your homeowners' insurance provider. After fire damage, during some situations, wooden surfaces of your contents and structural components can get charred on the surface. If the charring only exists on the surface of wooden items such as your wall studs, then it is possible that we can refinish them without having to replace them. If the charring on wooden materials only exists on the surface and does not exist a quarter inch into the wood, then we can often sand off the burnt substances and save the object. If you ever need help with your contents or building materials getting burnt or charred during a fire, call SERVPRO of Campbell at (408) 371-4001 any time of the day. Visit the City of San Jose's Illuminating Downtown Program, click here for more information.